When LeBron James looks back on his career in 30 years, he will most regret signing with the Miami Heat. James took his talent to South Beach to play with two of his friends, Dwayne Wade and Chris Bosh, but more importantly, to win championships. The fact that the Heat did not win a title this year means the James-Heat marriage is already a failure. Miami came into the year predicting a dynasty, and while that still may happen, not winning a title with two of the NBA’s top five players every single year is flat-out disappointing. 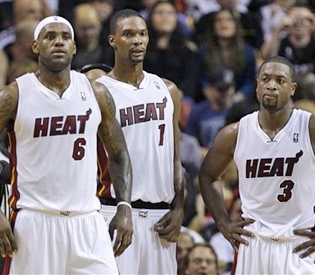 Miami has already failed once as a team in the boom-or-bust situation that James, Wade and Bosh have created. 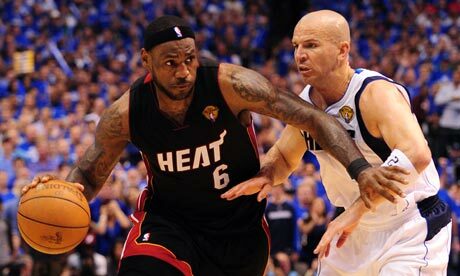 But with the way the Heat are constructed now, LeBron James can never be the player he has the potential to be. Sure, James averaged 26.7 points per game this past season, but that was his lowest total since his rookie season. This came in a year where James had the best field goal percentage (51%) of his career. When he played for Cleveland, the offense were through James, no questions asked. The Heat offense is run through either James or Wade, players with similar skill sets, creating an awkward and uncomfortable situation where the other is forced to be a role player on any given possession. Their games do not complement each other. Both Wade and James love attacking the rim with the ball in their hands. They are not jump shooters, but when they play together, more often than not, one of them is forced to be. There also may be pressure to defer the ball, because of the other’s talent and the desire to not leave that player out of the offense for extended amounts of time. Maybe that is why James’ aggression suddenly disappears in the Heat offense, which happened far too often in the NBA Finals. In Game 6, James started off 4 for 4 with 9 points in the game’s first 4:12. Just like that, James started to defer the basketball and not attack the rim. He scored just two more points in the first half, before not scoring in the second half until there was 1:49 left in the third quarter. After such a hot start, it is a mystery why James did not continue to attack the basket, instead hanging out mostly on the wing and getting rid of the rock whenever he drove. James suddenly looking lost in the offense never happened in Cleveland because everything there was designed to go through him. That is not the case in Miami. James’ lack of touch with the offense affects the way the team plays together. 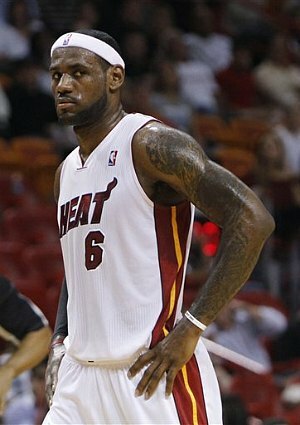 There is a reason why the 2009-2010 Cavaliers won 61 regular season games with James and why this year’s Heat won only 58 during the regular season. James’ Cavaliers, though less talented, played like a team and did not put any leashes on their superstar player. 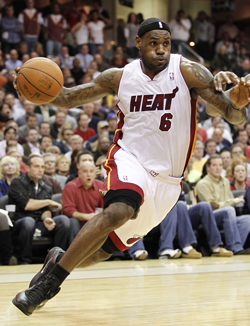 The Heat do not play as one, despite having far more talent, and unintentionally restrict their stars on offense. The way Miami plays will curb the supreme potential LeBron James has as a basketball player, both as a scorer and a winner, unless the Heat can figure out a way to play together. No matter how many championships the Heat may or may not win, LeBron James will always look back at his career and regret going to Miami. By falling to the Dallas Mavericks in this year’s NBA Finals, the James-Heat marriage has already failed and there will be even more pressure for Miami to take home next year’s title. This year’s Heat failed to realize their potential, and for as long as he plays for Miami, James will do the same. He looks lost in Miami’s offense far too often, feeling pressure to defer the basketball to the Heat’s other stars instead of attacking the rim himself. We were finally starting to see the immense potential of LeBron James during his final three years in Cleveland. With the offense being run through him, James was at times unstoppable. Now as he heads into his prime with the Heat, he will never have the freedom to dominate a basketball game like he did so many times with the Cavaliers. In 30 years, LeBron James will always wonder what might have been with his career had he stayed in Cleveland. This entry was posted on June 13, 2011 by Scott Kornberg. It was filed under LeBron James, Miami Heat and was tagged with Cleveland Cavaliers, Dwayne Wade, LeBron James, Miami Heat, NBA Finals, Scott Kornberg. I don’t really understand the point of this. You are simply reiterating what ESPN and every other person has said for the last year. Why would you spend the time to write this all up if your are not adding anything to the conversation?